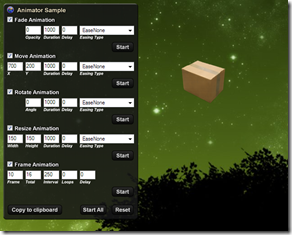 A small update for the Animator Component is now available. Changes from the internal version have been merged and a new method to remove all animations related to a specific object has been added. The Animator Sample now has checkboxes to enable/disable a specific animation and the requested script “export” has been added. You can now tweak your object animation and have a ready to use script copied to the clipboard.